There are no dull moments in the Dottie Mc Stuffins’ house. There is always a toy dinosaur that needs help brushing his teeth or a fairy whose wings need to be fixed. There is only one young girl for the job whose name is Doc Mc Stuffins! Dottie “Doc” McStuffins is a little girl who knows what she wants. She follows in her mother’s footsteps practicing her doctor duties on all her fairies, dinosaurs, and other toys. All she needs is her magic stethoscope and she is ready to make all her toys, dolls, and stuffed animals feel much better. To diagnose all illnesses, she uses “The Big Book of Boo Boos”. Start nursing your favorite dolls and stuffed animals with one of our cute Doc McStuffins Halloween costume ideas! We have two DocMcStuffin costume ideas that come with pants and one that comes with a pretty frilly tutu. Come on, become a doctor this Halloween and get candy for nursing your toys and dolls! Thanks to our fabulous assortment of Doc McStuffins Halloween costume ideas that include Doc McStuffins outfits for any taste, no one will be disappointed with their purchase. 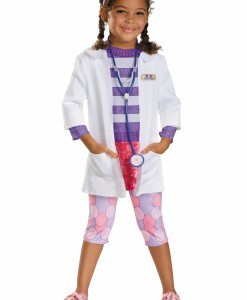 Every girl would be happy to get dressed as Doc McStuffins and look like a real doctor for Halloween. A Doc McStuffins costume with pants or a tutu – no matter what Doc McStuffins costume idea you are looking for, as long as we have stocked all Doc McStuffins costumes for any taste. All of our Doc McStuffins costumes offer a great opportunity to team up with your friends for some very special Halloween photos. With such a variety of Doc McStuffins Halloween costume ideas, it is difficult to pick up just one. We have all your Doc McStuffins costume needs covered with free delivery anywhere in the United States, Canada, and the UK. Buy also other Disney Costumes For Kids & Adults: Toy Story Costumes and Raggedy Ann Costumes for theme parties and, of course, Halloween!